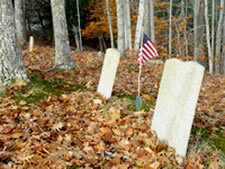 Nobleboro has at least 84 burial grounds, most of them family plots set aside for this purpose by the early settlers. The Vital Records for Old Bristol and Nobleboro, compiled by Christine Houston Dodge and published in 1951, identified 65 burial grounds in Nobleboro, but since then 19 others were discovered and noted by Nobleboro Historian Dr. George F. Dow. On behalf of the Nobleboro Historical Society, Dr. Dow prepared a binder documenting the cemeteries. Each cemetery has a page on which there is a photograph of the burial ground along with notes about who is buried there. The Historical Society has indexed the cemeteries with their locations and date of establishment (if known). Dr. Dow also prepared a map that shows the burial sites. This map included the 4 one-quarter acre plots accepted by the town fathers at their 1790 town meeting for use by those who did not have family burial grounds. This map was updated by the Nobleboro Cemetery Committee in 2009. These maps are available at the Historical Society. The Nobleboro Cemetery Committee continues to update cemetery information in order to develop a 5-year plan or restoration and maintenance of the cemeteries and headstones. The weekly newspaper The Lincoln County News publishes a feature column by committee chair, Laurie McBurnie “The Cemeteries of Nobleboro” compiled primarily from the material researched by Dr. George Dow. Many of our local residents and organizations have committed to caring for a cemetery. Their efforts help preserve a part of Nobleboro’s rich history. There continues to be a need for this care; so whatever time you may have, we can find a cemetery for you.